Apple Pay has people taking mobile payments seriously. "Apple Pay will forever change the way all of us buy things," Apple Chief Executive Officer Tim Cook said as he introduced the feature last month. Now, that won't happen overnight. And Apple Pay won't be alone. 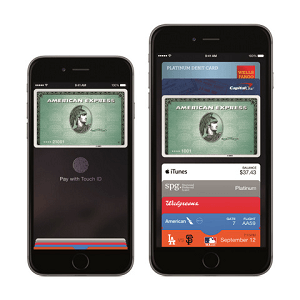 But make no mistake: The transition to mobile payments has begun. Mobile payment transactions in the United States alone totaled $1.59 billion last year. They will more than double in 2014 to $3.5 billion, according to research firm eMarketer. They'll more than double again in 2015 to $8.95 billion. By 2018, eMarketer projects that U.S. consumers will make $118 billion in mobile payments. Numbers like that are attracting a lot of powerful companies to fight over the spoils. Big profits await the winners. This war matters to investors, too. Picking a winner will mean big gains. Picking a loser means missing out. The sooner investors sort out who's who, the sooner they can start profiting from mobile payments themselves. We've already analyzed this trend and, even this early in the war, have spotted several winners and losers. The mobile payments shift will be complicated by bones of contention: fees and data. Credit card companies and the banks that issue those cards make billions on usage fees. They want to find a way to keep that money coming as consumers shift to mobile payments. Retailers don't want the fees. Retailers, along with certain big tech companies like Google Inc. (Nasdaq: GOOG, GOOGL), want a mobile payments system that collects extensive data on shoppers.